Define Success. Autism is a lifelong condition and currently cannot be cured. However autism can be treated and with the right early intervention, most children experience significant improvement in their quality of life and many children learn to function independently in mainstream school. 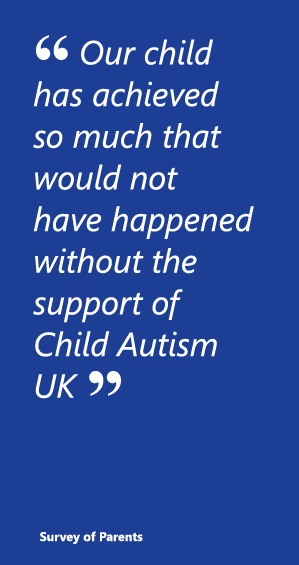 Child Autism UK helps children who are diagnosed with autism reach their full potential. That’s how we define success. The intervention works by enhancing intellectual, academic, social and emotional behaviours so that children can take better advantage of educational and social opportunities available in the community. There is a lot of research to look at, but the experiences of parents are also worth a read. You might like to start with the stories of some of our Stars, these are all examples of children who, with focused intervention, have achieved far more than would otherwise have been the case. The stories of Charlie, Hal, Joseph and Lewis are all different but each illustrates the benefits of early intervention. They show how early intervention can make a significant difference to the lives of children with autism and their parents You might also want to take a look at Guy’s story.